You may think that little has changed when it comes to making Bread, but facts suggests otherwise. Modern bread making is the salvation to the increasingly high number of poor dietary habits– plus you enjoy all the fun making your own bread. There has, however, been mixed reactions and experiences due to the different bread makers storming the market. The number 1 bread machine in Amazon, the Zojirushi BB-CEC20 Bread Maker let home-owners enjoy freshly baked breads and doughs for those who want to serve nothing but the healthiest food choices for themselves.Taste, share and enjoy bakery-style loaves from Zojirushu Home Bakery Supreme 2-pound Breadmaker. A rectangular-shaped countertop appliance in black and white colors. Measuring 12.8 x 13.6 x 18.9 inches, it only weighs 9 pounds. Sleek with a user friendly soft-touch LCD control panel it is currently the 4th best selling bread maker in Amazon. Enjoy freshly baked homemade loaves and dough from rolls to other sweets. Be a pastry chef in an instant with this amazing bread maker from Zojirushi – the trusted name when it comes to bread makers. Zojirushu Home Bakery Supreme has 1- pre-programmed setting that will fit to your needs. From crust settings to the type of bread, dough or jam that you wish this machine will do for you. Its unique setting is the Home-made which is a customized setting to the type of recipe that you have. Control panel with choices like basic, basic white, basic dough, basic wheat, quick dough – just to name a few. Crust can be set as light, medium or dark. Easy to use with its 13-hour delay feature. Choose your setting, add the ingredients and wait for the warm and inviting smell of freshly baked bread. Leave it before you sleep and wake up with a ready-to-eat homemade bread or leave it before going to work and dine with rolls for dinner. Zojirushu Home Bakery Supreme automatically keeps the bread warm for the next 30 minutes after it is made. Its double blade boost its dough kneading making it rise higher for the best loaves. Large viewing windows let users to open to check the bread without the bread winner stopping the operation while its removable non-stick pan makes it easier to clean. Zojirushu Home Bakery Supreme is very user-friendly from operation to cleaning. It has its preheat/warming cycle setting, no need to to warm ingredients to room temperature – just add it directly into the bread maker. Its look is very modern and stylish that will compliment any house. It is also stable, solid and works quietly. And because it can accommodate up to 2 pounds of loaves, this appliance is best for those with bigger household or those who love to share and serve homemade loaves and doughs to families and friends. Its name is already its asset. Zojirushi has an outstanding reputation in the market. It may cost higher than other brands but consumers can have the guarantee of a good machine when it bears the name of Zojorushi. Zojirushu Home Bakery Supreme cost higher than most bread makers in the market, even those with similar capacity. Its price is a risk to take given that there are many brands with cheaper costs. The attached manual is too complicated especially among those who are new to bread makers. Because of that, some cannot follow directions pretty well giving rise to poor results. There is no interior light for you to check the bread during the process. You have to open the viewing window to do this. Zojirushu Home Bakery Supreme is a brand with positive reputation among consumers. Though it is costly, it has created a good name that many consumers wouldn’t mind because they know that this bread maker still gives value to their money. Based on consumer reviews and scores, Zojirushu’s 2-pound pre programmed bread maker is a superior and high quality product. If you usually need 2-pounds of loaves with rectangular edges, then this is a great product to have. To ensure success in every loaf or dough, make sure you follow the instructions to the dot and always use the best ingredients. However, those who are just trying to use a bread maker or those looking for a basic machine, “investing” in a Zojirushi may not always be a good deal. Still, if you want a keeper, then this is for you. No need to buy bread from local stores which are filled with preservatives, wake up to the smell of freshly baked goodies with the SD-YD250. A revolutionary bread maker with the size of 14 x 13.5 x 9 inches and weighs only 15.4 pounds. Designed for home use, it is easy to operate. Simply add the ingredients, push some buttons and wait! It’s that simple. PANASONIC SD-YD250 Automatic Bread Maker is equipped with amazing product features making this machine one of the best in the market. Its control panel is user-friendly. LCD display, soft touch. Just a simple touch to your preferred mode – bread or dough and other operations. Added modes are the types of bread you want to achieve – white, wheat raisin and fruitcake. Even the color of the crust can be picked with a simple touch from its control panel. Very simple to use. This bread machine also has a digital timer of up to 13 hours. You can leave it at night an wake up to a freshly baked bread. Leave it while work and come home with a perfectly done dough for pizza or croissant. PANASONIC SD-YD250 Automatic Bread Maker has yeast dispenser that automatically adds the yeast for perfectly baked bread and dough that is crusty yet soft. Its temperature control program features ensures that your bread or dough will not be over or undercooked. You can only expect nothing but perfectly baked breads and dough. Same with its microprocessor program to adjust to local climate. The bake pan had a wire handle to make it easy to remove the bread without burning yourself. Its pan is also non-stick. PANASONIC SD-YD250 comes with a 1 year-warranty. With what it can do, PANASONIC SD-YD250 Automatic Bread Maker is very quiet. Thus, it makes making loaves very comfortable and convenience. It is also designed with a thick pan to give that even rising and the crust is simple perfect. Compared to other bread making machines, this particular model can make larger loaves. It can give 2 ½ pounds of loaves while other machines only have a 2-pound capacity. Its accessories are also great from its recipe booklet with 50 different recipes to try. Spoon, cup and kneading blade as also included in the package. When you receive your machine, you are all set in making your own bread at the comfort of your home. PANASONIC SD-YD250 Automatic Bread Maker can consume some space. It is not bulky as an oven of course, but it is not compact as that of a microwave oven either. Hence, those living in tight spaces may want to measure their own space first before buying this bread maker. It is fantastic with all the modes and choices when it comes to the type of bread you want to make with the PANASONIC SD-YD250 Automatic Bread Maker but some find this a little confusing. The different modes may be too much for those who want to make a simply fresh and home-made breads and doughs. PANASONIC SD-YD250 Automatic Bread Maker is impressive at its own right. A power tool in the kitchen. Making your own bread or dough. Dig in with your families or impress your guests with home-made breads and doughs. Much more, you don’t have to be a pastry chef or adept cook to make breads. The SD-YD250 takes care of that. A programmable mini breadmaker that is perfect for a single serve – no left-overs! Designed to make not just breads but cakes as well as dough for cookies, rolls croissant and paste. It also has a jam setting for those with sweet tooth. Portable and compact measuring 8 x 11 x 12 inches and only weighs 9 pounds along with its carrying handle. Its LCD control panel with soft-touch technology makes it easy for everyone to operate. Product comes with a non-stick kneading blade and baking pan along with an instruction ( both manual and video) and a recipe book. Zojirushi BB-HAC10 Home Bakery 1 pound-Loaf Programmable Mini Breadmaker is currently the number 6 bread machines in Amazon. Zojirushi BB-HAC10 has programmable settings for users to choose the type of bread or dough they want to make with this appliance. You can chose the variety – white orwheat bread or dough. It also has a texture setting for those who want their bread to have regular, firm or soft texture. Lastly, crust control like regular or light. It has a 13-hour delay. Just add the ingredients after choosing your desired setting and let this mini breadmaker do the job. Wake up to the aroma of freshly made bread upon waking up or when coming home. For those who want to cook faster, choose its 2-hour quick baking cycle. Want to eat a warm slice of bread everytime? This breadmaker has a keep warm feature. Enjoy warm bread with your favorite drink. Zojirushi BB-HAC10 comes with a 1-year warranty. As a mini breadmaker with a capacity of 1-pound per baking, this means that all loaves will be consumed. Most bread makers are 2-pounds which is good for larger families but there are many people who live alone or as a couple. This makes this breadmaker very appealing. Its size also suits well among modern dwellers – living in limited space. It is just like the size of a regular bread toaster and will not consume that much space in your countertop. It is also very portable for those who might want to take this wonderful appliance along. Zojirushi BB-HAC10 includes not just a manual but a video as well. A video is more effective in showing users the right way to use this appliance. Most appliance failures are human errors and the instructional video eliminates the said situations. Many customers praise the BB-HAC10 on how easy it is to use and clean. Zojirushi BB-HAC10 as a mini breadmaker with a 1-pound capacity is obviously not fitted for those with a bigger family or group. One loaf made from this bread maker is only good for 1-2 persons so it might be a problem for those who want a bigger loaf. Its quick baking cycle is longer compared to other brands. This particular model has a 2-hour fast baking cycle while there are some brands who can do it in less than an hour. Some things comes in small packages and the Zojirushi BB-HAC10 is one of them. Compact and small which is common among Japanese products to suit the modern household – small and living in limited spaces. It might be small and only makes 1 pound of bread and dough but it is highly programmed to let users choose specific settings. In terms of market feedback, it is simply remarkable. With a customer rating score of 4.8 out of 5, there is no need to elaborate. Its consumers are more than happy with this product. Therefore, for those who want to own breadmaker but only has a small household, then this is the best bread machine for you. An Automatic bread maker with convection fan from CUISINART, makers of high-quality kitchen appliances. The CBK-200 makes up to 2pounds of bread and dough for those who want to make and enjoy their own loaves at home. Cost-effective and most of all, healthier. Built with horizontal baking pan with 16 pre-set menu on its touch button LCD control panel, it can make up to 100 bread, sweet cake, dough and jam recipes. From French toast, cinnamon raisin bread to jams and even cranberry juice! This bread maker measures 18 x 12 ½ x 14 inches and only weighs 9 pounds. It is finished with stainless steel for that elegant look perfect for today’s homes. The CUISINART CBK-200 has a convection fan to automatically adjust the speed and overall bakign timing. This feature ensures the best result and to deliver bread and loaf with the perfect crust and texture. As an automatic bread make, there are plenty of options courtesy of its 16 pre set menu. Choose the type of bread, the size of the bread, crust color and many more. A 12 hour-delay system to let you leave the bread maker as you do your own activities and get back once it is already done. In case of power interruptions, power-failure backup feature will automatically resumes to the stage where it stopped. The CUISINART CBK-200 has a 3 year warranty. With its 16 pre-set menu options, users can have the exact loaf that they want. Specifically those who are into healthy lifestyle, settings for Low-Carb and Gluten-free is a good point. The warranty that CUISINART offers is longer than most brands. It is also very affordable. One of the most affordable bread makers in the market today. Though it is made from stainless steel, most of its materials are not the best and the most superior. The inside is made of aluminum and the pan and interior are not non-stick. Hence, they tend to heat up faster and it is not easy to remove the loaf from the pan. The convection fan helps in heat control but not that much. The unit is also louder and keeps on beeping especially during kneading cycle. With noise like this, the time delay feature is not that relevant after all – unless if you go out of your house. CUISINART CBK-200 does not have a preheat cycle. Meaning, some ingredients have the warmed up to room temperature before adding to the pan for mixing with the rest of the ingredients. CUISINART CBK-200 is an affordable bread maker which is good for those who want to try using this appliance and not risking too much by buying an expensive brand. With various pre-sets and conventional fan, it can indeed make good and tasty breads. However, given its low price and features, realistic expectations must be settled. Likewise, directions must be followed carefully to ensure that breads and doughs will be cooked perfectly using this bread maker. This is a good bread maker but never expect too much. For its price, this is already a nice purchase. Love to make your own bread at home but want an inexpensive machine? Sunbeam 5891 is an affordable bread making machine with a capacity of up to 2-pound bread. Weighing only 19 pounds with a dimension of 19 x 13.5 x 14 inches, this is one small appliances that you can place on your countertop. Make bread with fresh ingridients for you and your family and of course, for your guests. Enjoy French bread for breakfast, a whole-wheat sandwich for lunch and end your day with delectable butter rolls for dinner – all these from your Sunbeam 5891. Sunbeam 5891 is a easy push-button control panel with large LCD display. This control panel makes making bread like a breeze. A simple touch to these buttons and you can taste the bread you love. This control panel has different settings from crust selections like light, medium or dark. This machine will also beeps to signal you to add your nuts, raisins and other dried fruits for those who want some “gourmet-like” breads. The Express Bake feature let you have a bread in less than an hour. Perfect for those in a hurry or those with unexpected guests. Its 13-hour programmable feature let you add the ingredients and just wait for the bread to be done. Sleep, go out to work and you will wake up or arrive with the tempting smell of freshly baked bread. 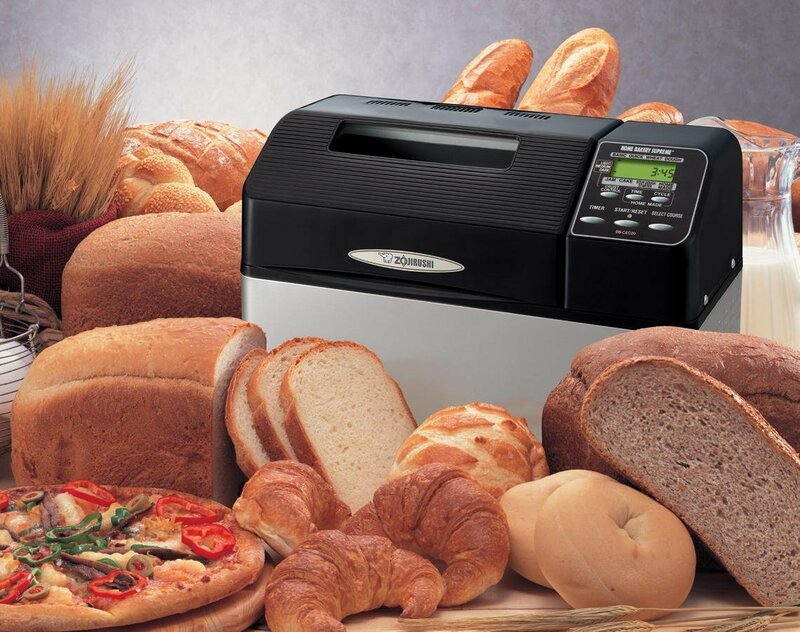 Like other bread machines, the Sunbeam 5891 has the same size like any counter-top appliance. Nd with what it can do freshly baked, bakery-style breads at the comfort and incovenience at your own kitchen, this machine totally rocks. When compared to other brands, its main advantage is its cost. It is very affordable and great for those who want to test the waters when it comes to bread machines. Sunbeam 5891 is designed to be user-friendly that even novice cooks can take pride making their own breads with this bread maker. Its glass viewing window is large enough for you to check and peek without the lid being lifted. Sunbeam 5891 is a promising and wonderful bread makers but there are some things you want to consider before purchasing this appliance. With its low price, comes a price too. You cannot expect this machine to b heavy duty. It will not wear out easily but if you are the type of person who want to use this on a daily basis with larger volume, then it is best to look for other brands. Some parts of this bread maker is made of plastic and because of this material, they will break and tear faster. Its settings when it comes to types of bread are also limited. Though it has some choices when it comes to crust, other superior bread maker can also whip and knead dough and let you choose different types of breads. Those looking for a less expensive bread machine will find the perfect one with the Sunbeam 5891. This particular model is also great for those who want to try having a bread maker, like an experiment. Its affordable is the main reason why many people purchase this product. With its lesser price tag, there are some things that consumers should not expect more. One is power, it is more of home and occasional use if you want to keep this for a long time. Same with the perfection of its bread. There may be some glitches in achieving the perfectly done homemade bread with the Sunbeam 5891. It delivers what it should give to consumer – freshly baked bread. No need to go out to the bakery and enjoy preservative-free bread. A breadmaker that can at par to the performance of other brands at half a price, WEST BEND 41300 Hi-Rise Electronic Dual-Blade Breadmaker is a must in every kitchen. With two blades for more power in kneading, loaves will rise more without additional yeast. This is one appliance that can make horizontal loaf with texture and taste like of a gourmet pastry shop. Lots of pre-program settings, 11 to be exact. From 2 crust shades to a wide variety of loaves, dough and jam settings. It also has options for the size – 1 lb, 1 1 ½ lbs, 2 lbs and 2 ½ lbs. A 13 hour-delay feature to let users add ingredients and do their work and activities and ready just in time for breakfast or dinner. WEST BEND 41300 is covered with a 1-year warranty. WEST BEND 41300 has many pre programmed settings that can match different preferences of a user. With these choices, it is easy to make a bread or dough with single touch to its LCD control panel. Among its programmed settings, the size option is one of the best. Very specific from 1lbs to 2 ½ lbs. Perfect for those who only has a small household and when there are more diners like inviting friends, it is easy to increase the size of the bread – no left-overs or uneaten bread. With its hi-rise technology, adding yeast or additional yeast is not a problem. It is very affordable, half the price of other brands. At 18 pounds, this unit is heavy. Other brands only weighs 9 pounds making this bread maker twice as heavy as the others. The manual included needs to contain more information. It lacks information like a time table on how long each bread will cook. Though it has two blades, it takes longer for the WEST BEND 41300 to mix, rise the dough and knead before the exact bread making process. This breadmaker is not made of top notch materials. There is a question when it comes to durability and wearing especially if the unit will be used many times. WEST BEND 41300 Hi-Rise Electronic Dual-Blade Breadmaker is an affordable alternative to high-end and expensive bread makers. It can compete in terms of the quality of bread and dough it can produce. Consumers who are not comfortable spending too much from this appliance will be appealed to this model. However, if you want something that will last for decades, this might not be the perfect bread maker. Typical to most affordable, they can easily wear and may not be as durable as other expensive brands as the materials are less superior compared to the latter. Still, Hi-Rise Electronic Dual-Blade Breadmaker has a positive reputation in the market and can be recommended for those who wish to have a reliable bred maker without spending too much. The power to make your own bread. Try different recipes from doughs to rolls. For you to enjoy a slice of freshly baked wheat bread, enjoying a loaf with family and sharing them as you host your visitors. One of the best bead makers in the market without the high cost of high-end machines. Breadman TR520 measures 13.5 x 12.2 x 13.5 inches and weighs 13 pounds. With soft touch LCD contro panel, it is easy to use and create the best oaf for you and your family and friends. It currenty ranks 8th among Amazon’s bread makers. Breadman TR250 has 8 functions and pre set programs for users to choose their desired loaf. These settings cover crust color, loaf size and loaf type. Crust colors can go from light, medium to dark while loaves can be made – 1 pound, 1 ½ pounds and 2 pounds. This feature is great if you wish to make a small serving of bread like a serving for two people then add the size to 2 pounds for example when planning to serve it to a larger group. Its fast cycle feature makes bread in less than an hour and automatically keeps it warm. Its horizonta pan creates, horizontal loaves with square edges – great for sandwiches. This product is covered with a 1 year warranty. This Breadman TR250 has great features and can make scrumptious breads and loaves but other brands and models can also take pride in these performances. The thing that puts this bread maker in pedestal is its affordability. For less than $100, you can own this amazing appliance. A revolutionary kitchen tool giving more freedom to enjoy not just fresh but healthier food. With its designs and programs, this Breadman is easy to use. Simple soft-touch control panel. Set it add the ingredients and let it finish the job. It is works quietly and cleaning it is easy too. Breadman TR250’s features are good but they are basic when compared to other bread makers in the market today. Same with expert bread makers. This appliance only has few pre programmed settings. It only has 8 while other have 12 even 16 settings. For one, it lacks the dough settings. Many users want to make their own pizza dough and this bread maker cannot do it. Its LCD display is a big design flaw. It will not tell or display which stage of the bread making it is and the letters are written in pale color. With the background, it is very hard to read. Much more for those with visual limitations. Breadman TR250 Programmable Bread Maker for 1- 1 ½ and 2 pounds Loaves is a good product especially those who want to try using this kind of appliance in their kitchen. It is very affordable which is one of its main advantages over some brands but along with affordability are some limitations and one of these is the lack of settings. Frankly, TR250 is a very basic bread machine. This can be great for those who just want freshly baked homemade loaves but can be disatisfactory among those who want more than just white bread. Affordable and basic yet very good in making breads, Breadman TR250 is a good deal and highly recommended.